Bucknell jumped out to a 7-1 lead, the Lehigh men’s lacrosse team pulled within four, but couldn’t get any closer as the Mountain Hawks fell 13-8 at Bucknell in the Patriot League Quarterfinals on Tuesday evening. 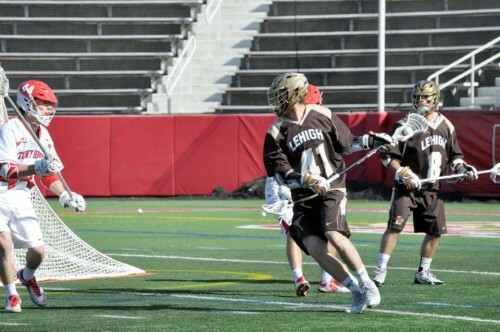 Junior Reid Weber led Lehigh with a career-high five goals while senior Dan Taylor tallied a goal and two assists to finish his season with 77 points and storied career with 220, good for fourth in league history. Weber and Taylor combined for six goals and three assists while senior Kurtis Kaunas and sophomore Casey McAdam scored goals as well. McAdam came into the faceoff X and impressed, winning 14-of-21 to give the Mountain Hawks a chance to pull closer. He also scooped a team-high seven groundballs. Defensively, junior Casey Eidenshink had four groundballs and two caused turnovers while Weber scooped four groundballs on the attacking end as well. Bucknell came out on fire, scoring the game’s first five goals to put the Mountain Hawks into an early hole. Weber got Lehigh on the board with 23 seconds left in the first quarter off a feed from senior Alan Henderson, pulling Lehigh within 5-1 after 15 minutes of play. The Bison responded with the first two goals of the second quarter. After Bucknell made it 6-1, Taylor had a point-blank opportunity but Bison goalie Sam Grinberg made a big stop. That led to a Thomas Flibotte goal on the other end less than one minute later which made it 7-1 with 13:12 on the clock, forcing a Lehigh timeout. From there, the Mountain Hawks outscored Bucknell 2-0 the rest of the quarter, both goals coming from Weber off feeds from Taylor. The first was on a delayed penalty and the second was on the extra man, helping Lehigh pull within 7-3 at the half. The teams traded goals to begin the third quarter until the Bison scored two straight to take a 10-4 advantage with 5:21 left in the third quarter. Weber answered with his fourth of the game directly off the ensuing faceoff, corralling a loose ball after a save and finding the open net. However, Bucknell scored the final goal of the quarter to taken 11-5 advantage after 45 minutes of play. Bucknell took a 12-5 lead early in the fourth quarter, but the Mountain Hawks responded with three of the game’s final four goals. Weber scored his fifth, from Henderson, followed by McAdam’s first-career goal on a rebound and a Kaunas tally, from Weber, which made it 13-8 with 2:35 remaining. That proved to be the final. Final shots were 38-33 in favor of Lehigh while the Mountain Hawks held a 32-27 edge in groundballs. Freshman Adam Sawicki made two saves before being relieved by sophomoreDonny Stires who made five stops. Grinberg made 13 saves for Bucknell, including nine in the second half. Lehigh ends its season at 7-9, advancing to its fifth straight Patriot League Tournament appearance. The senior class tied last year’s class as the winningest in program history, advancing to four league tournaments and winning two championships.